The thought of today's "country music" genre is enough to make this reviewer's skin crawl. Almost no other recollection is more irritating than the memory of high school dances gone by, predominantly backdropped with a Garth Brooks soundtrack. Flashes of two-step, ill-fitting cowboy hats and oversized belt buckles, some nasty substance called chaw, and off-key, twangy impressions spring to mind, stereotypical as they may sound. And if 16-year-old me knew that 30-year-old me would willingly and constantly blast a country album while driving around town, she would be wildly perplexed. Fortunately, none of those memories is drudged up while hearing The Grisly Hand's latest full-length effort, Country Singles. The six-piece group masterfully composed twelve solid tracks (along with a special bonus track if you have the album; and if you don’t, get it now—you won’t regret it), presented in a way that brings a broad appeal to its music, yet maintains its core. Country Singles is still, in essence, a country album, but it incorporates a healthy blend of classic country with pop, rock, folk, blues, and soul influences. The personal touch each member contributes to each song provides an extra boost of originality and character, and the production by Joel Nanos at Element Recording invites a quality that reaches far beyond the typical lengths of a locally-produced record. In previous works, the strength of each track was primarily found in the pristine vocal harmonies of Lauren Krum and Jimmy Fitzner. But with a careful eye on production by Nanos, a new combination of members (this is Mike Stover's and Matt Richey's first recording with the group), and an ever-maturing sense of songwriting, Country Singles stands out as a premier local album. The characteristically pleasant vocal harmonies by Krum/Fitzner continue to pervade the majority of the LP, but they push through each track with a more confident collective voice and project a stronger personality through their colorful brand of storytelling. One of the best examples of this is on "(If You're Leavin') Take the Trash Out (When You Go)," a jaunty track that nonchalantly tells the story of a breakup, driven by Krum’s intrepid vocal delivery and Fitzner’s accompaniment. On this track—among several others on Country Singles—Richey shows his ability to outshuffle any drummer in Kansas City, helping carry a consistent heartbeat throughout the LP’s most classic country tunes. Guitarist and mandolin player Ben Summers also puts his songwriting abilities on display throughout the album, on songs like “Municipal Farm Blues” and “Coup de Cœur,” a lovelorn duet between him and Krum, accompanied by Stover’s masterful, lonesome steel guitar work. These are just small examples of the diversity of the LP, which is best captured in the middle of the album with “Amusia” and “Blind Horse.” While the first four tracks contain the signature Grisly sound, these two are direct counterpoints that retain just enough of the band’s style to shine slightly brighter than the others. The songs show a deeper side of the band, both in emotion and composition; and perhaps the album’s finest moments are found on these tracks. One is the haunting minor-note instrumental/vocal performance that resolves at the bridge of “Amusia.” The other sort of just occurs throughout “Blind Horse,” as the physical and emotional force of Krum’s voice is pitted against intermittent breaths of a simplistic but equally-as-compelling piano, also played by Krum. Country Singles is The Grisly Hand’s finest work to date, because the band maintains its roots and style while integrating a variety of influences and emotions, along with plenty of humor (the idea and liner notes were inspired by a rural newsletter for lonely singles), dynamics, and depth. No doubt this is already a strong contender for local album of 2013. Yesterday, The Grisly Hand released a video for “That’s Not Affection,” directed by Dan Myers. Check it out below! The Grisly Hand -- That's Not Affection from The Grisly Hand on Vimeo. 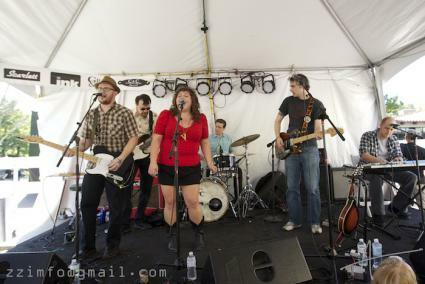 You can check out The Grisly Hand on a big stage this Saturday, September 14 at Crossroads Music Fest. The band will play Crossroads KC at Grinder’s at 8:10 p.m. You can buy tickets in advance at this link for $15, $20 at the gate. Michelle is editor of The Deli Magazine - Kansas City, and also plays drums Drew Black & Dirty Electric and bass in Dolls on Fire and The Philistines. One member of The Grisly Hand claims to be toothless, and she knows which one it is. Do you? 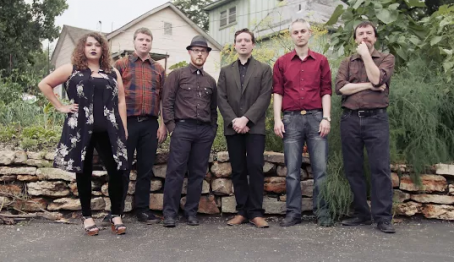 Our next featured Crossroads Music Fest artist is The Grisly Hand. This 5-piece group released its well-received EP Western Ave. earlier this year, and is currently working on a full-length album. 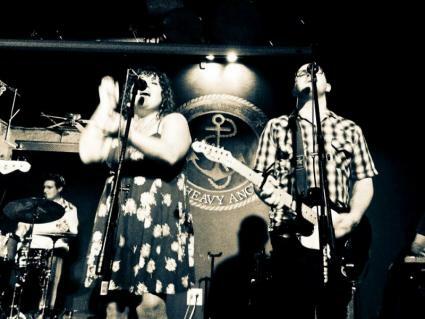 The strong, melodious female voice behind The Grisly Hand's music, Lauren Krum, talks to us a little about the group. Lauren Krum: WHY IS THERE A GUN TO MY HEAD OH MY GOD NOOOOO. The Deli: Tell us about your latest release or upcoming shows. What can we expect? Lauren: We are playing Friday with The Good Foot and The Supernauts. We love sharing the stage with The Good Foot and are excited to be back on the Crossroads stage. The sound is great and the stage is huge. The Deli: What does "supporting local music" mean to you? Lauren: Going to shows and paying the cover. Being positive and responsive to fellow musicians. The Deli: Who are your favorite "local" musicians right now? Lauren: Radkey, Tiny Horse, Mikal Shapiro, Dead Voices and we really enjoyed Loaded Goat & The Latenight Callers at Paris of the Plains Cocktail Competition this year! Lauren: The Dirty Projectors, Sharon Van Etten, Menahan Street Band and The Reigning Sound. The Deli: What bands are you most excited to see at Crossroads Music Fest this year? Lauren: We already mentioned some of the performers as our favorite local musicians. Otherwise, My Brothers and Sisters is pretty intriguing. The Deli: What is your ultimate fantasy bill to play on? Lauren: Opening for Gary Floater at Hollywood Bowl. Lauren: On stage. Though recording is pretty fun, especially with Joel Nanos at Element Recording. Lauren: I'd put 5, John, Ben, Jim, Matt and Mike. And if there can really only be 4 I guess Mike and Ben kind of look similar if you cross your eyes. You can see The Grisly Hand at Crossroads KC at Grinder's this Friday at 9:30 for the pre-party with The Good Foot and The Supernauts. Don't miss em! Michelle is editor-in-chief of The Deli - Kansas City. She also has a weekly column with The Kansas City Star and reviews music for Ink. She plays with Deco Auto, Drew Black and Dirty Electric, and Dolls on Fire. She was voted Most Changed in her senior year of high school and she still isn't sure why.